Last week, i met Akihiko Shirai at Laval Virtual. Mr Shirai is an Associate Professor at the Departement of Information Media, Faculty Of Information Technology, Kanagawa Institute of Technology. He showed the Tuvalu Visualization Project, which I presented in one of my tweets, but this project deserves a better presentation. "The purpose of project is to disclose actual information about People and Scenery in Tuvalu to the world. It is said that Tuvalu is exposed to danger of going under water by sea level rising because of global warming. However, we suppose that it is important to understand not only the problem of global warming, but also the real situation of Tuvalu. The Internet is an effective tool for collecting information, but it was difficult to obtain information of the real situation of Tuvalu from the Internet. Therefore, we produced this project to present the real situation of Tuvalu, to improve the interest in Tuvalu, and to receive feedback from all over the world ." 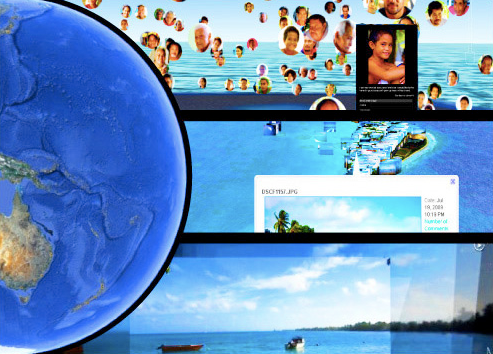 In these contents, Google Earth is used as not only a satellite image viewer but also an interactive art form of portraits archive and geographical information of Tuvalu. Tuvalu Mapping is a photograph archive of Tuvalu on Google Earth. This content represents the scenery of Tuvalu. We did a fieldwork for taking pictures with GPS information in Tuvalu (Jul.07 - 23, 2009). More than 5000 pictures of coastlines, a runway of airport, sky, and all roads of Tuvalu were taken. 3300 placemarks and 400 photo-overlays on Google Earth are available now.